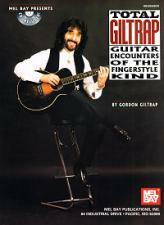 For two years Gordon wrote an acoustic column for TOTAL GUITAR. This book is almost a complete collection of that popular column; a comprehensive insight into the man's unique technique, and is a must for his legion of guitar playing fans. The columns covered virtually every aspect of his rather unorthodox approach to the instrument, including open tunings, hints on technique, scales harmonics, finger exercises, and extracts from the most popular pieces. To make things clearer for the student each piece came on the magazine's accompanying CD. The examples on the original CDs have been collated into the book's accompanying CD. It includes tablature and music to all the tracks as well as hints on technique, tunings and many previously unpublished archive photographs. It also comes with a forward written by the guitar legend from Queen, Brian May. A collection of wonderful music for non-guitarists and for all the players a great chance for a private lesson with a legendary musician!